The Stelos Alliance Awards Banquet was held on Sunday, April 28th in San Marcos. We had about 70 people attend the event where we awarded scholarships to exceptional student leaders from Texas State. 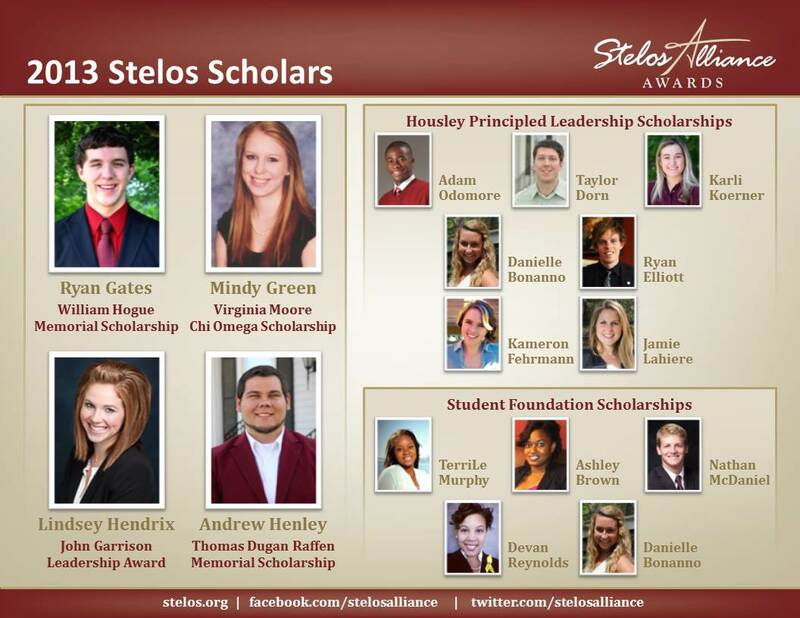 Stelos proudly leads the effort to raise money for a number of annual awards that benefit Texas State students. The scholarships include the Bill Hogue Memorial, John Garrison Leadership Award, Tommy Raffen Memorial, Student Foundation Scholarships, Chi Omega Virginia Moore Scholarship, and the Housley Principled Leadership Awards. We also began a fellowship program this year. Students selected as Stelos Fellows create a paid, semester-long internship with the Stelos Alliance that is customized to best suit their individual career objectives. This is the 23rd year that the Bill Hogue Memorial Scholarship has been awarded to a member of the Texas State Student Foundation. The recipient this year is another outstanding student leader, Ryan Gates. Ryan will be graduating with honors this May with dual Bachelor of Science degrees in Mathematics and Biochemistry. He currently serves as the Vice President of Administration for Student Foundation and has been a member since 2010. His GPA of 3.89 kept him on the Dean’s List every semester of his college career. His older brother Stephen received the same scholarship two years ago. The Gates do it right. Danielle Bonanno graduates this May with a Bachelor of Science degree in Criminal Justice and starts law school in the fall. She also won a Housley Principled Leadership Award this spring. Nathan McDaniel will be graduating August 2013 with a Bachelor of Arts degree in Political Science. Nathan completed the Housley Principled Leadership Program as a sophomore in 2011. Ashley Brown is graduating this May with a Bachelor of Public Administration degree. Devan Reynolds graduates in May with a Bachelor of Public Administration degree. Terrile Murphy also graduates in May with a Bachelor of Arts degree in Psychology. The John Garrison Leadership Award recipient is Lindsey Hendrix. Lindsey graduates in May with a Bachelor of Science degree in Communication Disorders. She served as the Executive Assistant in the Associated Student Government and was an active member of Student Foundation. She went through the very first edition of the Housley Principled Leadership Program back in 2011. This is our fourth year to award the Tommy Raffen Memorial Scholarship and this year’s recipient is Andrew Henley. Andrew is graduating in August 2013 with a Bachelor of Public Administration degree. He currently serves as the Executive Vice President of Student Foundation, as well as, Senate Pro Tempore for the Associated Student Government. Andrew is a Housley grad and was a Stelos Fellow this spring. This year, we were proud to award the Virginia Moore Chi Omega Scholarship for the second time. The recipient of this award is Mindy Green. Mindy is currently majoring in Public Relations at Texas State University. She is an active member of Chi Omega, where she currently serves as the sorority’s Scholarship Chairwoman. Mindy was a star in the Housley Principled Leadership Program this semester. The Housley Principled Leadership Program continues to grow. We conducted the class in both the fall and spring this academic year and had over 60 Texas State students complete the course. These are amazing students. For the past two years both the President and Vice President of ASG have been through the program; Nathan McDaniel, Alison Sibley, Vanessa Cortez, and Eddie Perez are all graduates, as are a large number of ASG senators. We are proud of all that they are accomplishing during their time on campus. Karli Koerner is currently majoring in Communication Studies at Texas State University. Karli was also a Stelos Fellow this spring doing marketing, event planning and Housley coordination. Adam Odomore is currently majoring in International Relations at Texas State University. He was the only freshman in Housley last fall and is simply an extraordinary young man. Danielle Bonanno graduates this May with a Bachelor of Science degree in Criminal Justice. She is also a Student Foundation Scholarship recipient and future Supreme Court justice. Taylor Dorn is graduating this May with a Bachelor of Science in Geology. Loic Hamilton graduated this past December with a bachelor’s degree in Accounting. Kameron Fehrmann is currently majoring in Communication Design at Texas State University. Ryan Elliot is currently majoring in International Studies at Texas State University. Jamie Lahiere also graduates in May with a Bachelor of Business Administration in Management. We are extremely proud of these young leaders and are amazed by their character, commitment to service, enthusiasm, and incredible accomplishments. They will all go on to do great things and make us proud. Please join me in both congratulating and thanking them for all they have done for Texas State.